eDay2 was a great success. Many thanks to all those Makerspace members who came along on Saturday (7th September) to Gateshead Central Library and helped out during the day or just showed up to give moral support. We had at least 5 3D printers on display, numerous Arduino projects, Makey Makey, Bare Conductive painting and Raspberry Pi stuff. The day was well attended with around 250 people coming along to see what it was about. Around 50-60 teachers, students and parents attended the Raspberry Pi workshops. Last year Makerspace helped organised a special technology and digital skills event called eDay with Gateshead libraries which introduced the general public to new technologies such 3D Printers, Raspberry Pi’s, Arduinos, Lego Mindstorms etc. eDay was a first for UK public libraries (and possibly the world). It was really well received with lots of other public libraries looking to emulate the event. This year eDay2 will be on Saturday 7th September 2103 and will take place as part of the British Science Festival. 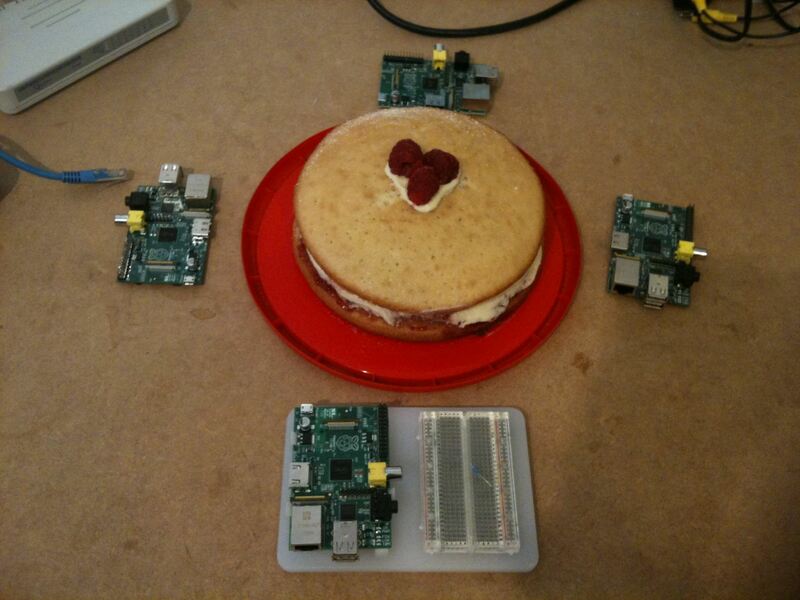 They’ll be Raspberry Pi workshops in the morning and afternoon. These will be delivered by Dr Alun Moon from Northumbria University, assisted by my good self. As well as Makerspace, Vector76 will there again and this time they’ll be bringing their awesome Oculus Rift! There’ll be lots of other groups helping out so expect to find lots of other digital stuff going on during the day. Last night saw the Maker Space in Newcastle celebrate a whole year of hosting its regular and free open sessions. The Open Sessions happen every 1st and 3rd Wednesday of the month as well as a all day weekend workshop on the last Saturday of the month. On the night we had a couple of 3D printers making stuff, the Spaces MakerBot (on loan from Jay) and Will’s new RepRap. There was a great discussion about how to use both Ardunio’s and Raspberry Pi’s for a garden monitoring project. Wow, May’s been a busy, busy month for me. My day time job has taken me off to foreign climates for most of it, while what little time I’ve had home has been spent messing around with the Raspberry Pi. Returning to the end of the April, a number of us from the Maker Space were asked to given a short talk at the Super Monday group. I haven’t done any public speaking since my University days, so I was very nervous about it. Nigel Hope introduced us the BeagleBone, a powerful and opensource development board. Here’s a beta release of a On Screen Display (OSD) shield I’ve been working on, it still needs a bit tiding up. It uses a MAX7456 from Maxim for the video overlay function. The MAX7456 is connected to the Ardunio’s SPI port (MOSI, MISO and CLK) and a double row of 0.1 headers can be used to choose which digital pin drives chip select (CS) for the MAX7456. In addition to the MAX7456 OSD chip, there’s also a DS1307 Real Time Clock (RTC) with battery backup for displaying time and date in the video feed. 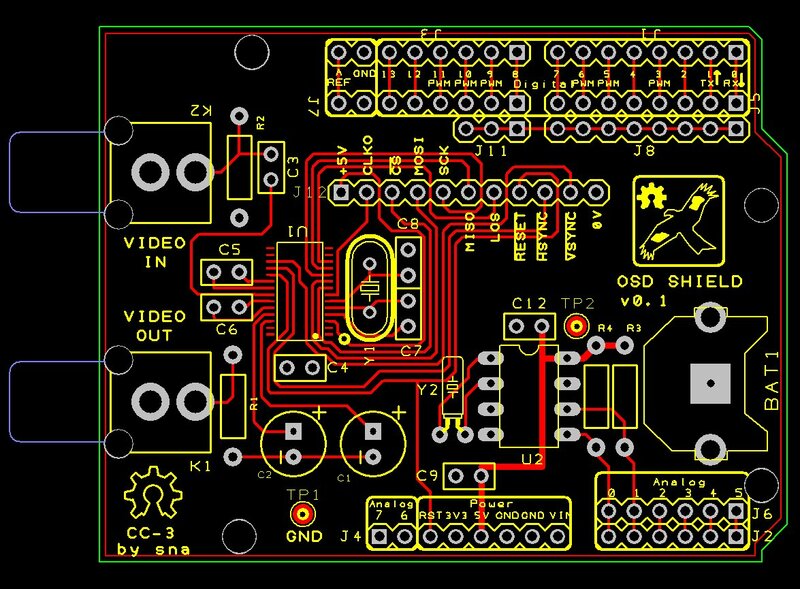 I designed it using DesignSpark PCB, pulling in the MAX7456 footprint from the Sparkfun PCB library. I’ll post design files and gerbers shortly. For software, I used code from Arduino forum members dfraser and zitron in this Arduino forum post. The Ardunio PLC design I designed is nothing without software to drive it. My initially thoughts was to hardcod the process logic using C programming code. This would involve reading from the AVR’s I/O pins with digitalRead() and writing back using digitalWrite(). Process Logic in-between the “in” and “out” instructions would be written using if’s, else’s and switch C statements to perform the desired logic task. After spending some time in the Raspberry-Pi forums, I realised this approach while fine for myself and other C programmers but it would not be suitable for beginners. So, I’ve begun looking at ways to make a full PLC programming environment for the Arduino PLC. A developer will write their PLC statements using a PC based environment such as free automation tools from and Beremiz and CoDeSys. Once the plc program is complete, it can download the control program to a IEC-61131 run time such as LDmicro, executing on the Arduino PLC hardware. At last the Arduino team have announced an official 32-bit ARM board. The specs look pretty standard for a ARM Cortex-M3 but they’re nice specs none the less. Analog I/O: 16ch 12-bit Analog Inputs. Not sure of the PCB package size but it looks like a 100 or 144 pin TQFP. I’m not sure if the SAM3U uC is 5V tolerant, which could be a problem for some 5V only shields. On the whole the 32-bit Arduino looks like a winner, now lets hope the 32-bit Arduino software is as good as the hardware.